For some time, crocheters have been wishing for interchangeable crochet hooks, similar to what users of KnitPicks, Denise, and Boye knitters were able to use. The Amazing Needle from Amazing Yarns filled some of the void but still we hungered for more. And finally, Denise Interchangeable Knitting Needles has come to the rescue with a set of interchangeable crochet hooks that can be used with the same cords used with their interchangeable knitting needles. Wholesale orders are currently being shipped to local stores with the retail launch occurring the first week of September. You can also purchase 14″, 19″, 30″, 40″, and 52″ cords separately. The cord connectors for the hooks snap and twist into the end of the hook, with no chance of coming undone like screw-in connectors tend to do. They move easily when connecting or disconnecting with little effort on your part and a slight curve in the end of the hook provides an excellent grip for your hand as you twist. The hooks are made of plastic with no edges and have an extremely smooth connection between the hook base and the cord so nothing will catch on it. Sizes are molded into the base of the hook head so they won’t wear off with use. The hooks themselves are pointed enough without being too rounded and seem like they would work great for slip stitch crochet projects. The different cord sizes allow you to use the hooks in a variety of ways, as a regular hook with the 3″ cord, as a Tunisian hook, a circular hook, or even to knit with a crochet hook on each end. The storage case has slots for each hook and the cords, end buttons, and extenders that come with the kit. On the left side of each hook is the US hook size while the millimeter size is on the right. Now, to be honest, when I was looking at buying interchangeable knitting needles, I was concerned that the larger needles had such a difference in size between the hook base and the cord, so I ended up getting the KnitPicks set. 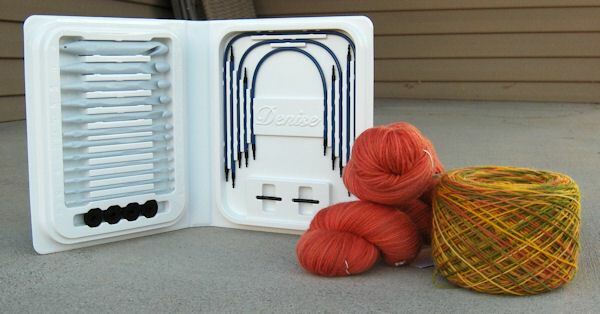 That being said, I wish I’d had the opportunity to try out the Denise Needles as I would have probably gone with them instead (although I love my KnitPicks). Fortunately, I was sent a set of their needles and an extra set of cords and crochet hooks (for double ended hooks). So, for all you crocheters out there who have been dreaming of this very moment, as soon as your local yarn store has these kits in stock, snap them up! Show Denise that they were right to be the first company to listen to our requests and actually do something about it! I think this deserves a Flaming Hook of Justice award (pokes Laurie). And, for those who would like to try these hooks out with the Amazing Needle technique, you can purchase instructions booklets for $5.95 as well as several patterns at Amazing Yarns.